No beach-bound round up would be complete without some nautical stripes -- and I'm pretty smitten with the baby blue on this version! With a swipe of red lipstick, some broken in cutoffs and canvas sneakers, it's hard not to channel your inner Bardot in this getup. If you're just joining now, check out my first StyleMint look here and, as always, you can shop their full selection here. I am loving this look! Beautiful! Love this tee and photos. So casual but yet still very chic! Love this look! And, of course, you can't go to the beach without reminiscing nautical fashions! I like how you kept the color scheme in the more pastel range. I love stripes and that is an amazing blue colour! Love love LOVE stripes. For real, my closet may look a little "Wheres Waldo". haha! Love the outfit. Love the look! Such a fun summer outfit! Beautiful and simple outfit! I like it! awww, i just love these pics! looks so hamptons to me! LOVE the stripes! 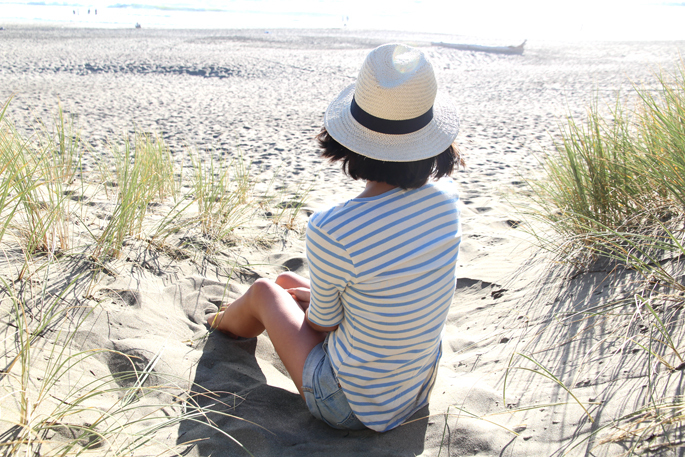 Love that straw hat...I wish I was at a beach. Love the look! I just did a beach post myself too! Aww heck. Now I want the baby blue stripe! Seriously, check out Stylemint -- lovely, lovely tees, great sales and promotions, attentive customer service. The site is kinda fun to wander around in too. Gorgeous look. Very relaxed chic. Just perfect for a day at the beach! Great casual look! Stylemint has great shirts! Love, love love that first image. And the baby blue stripes too. Perfection for the stroll on the beach! i'm loving these beach photos of you! and the orangey-red lip? amazing how it perks up the whole look! omg these beach photos make me want to go on vacation. Love your top. Love how casual but california cool this look is :) adore the hat! Prefect for the beach or brunch! Love this simple beachy look! 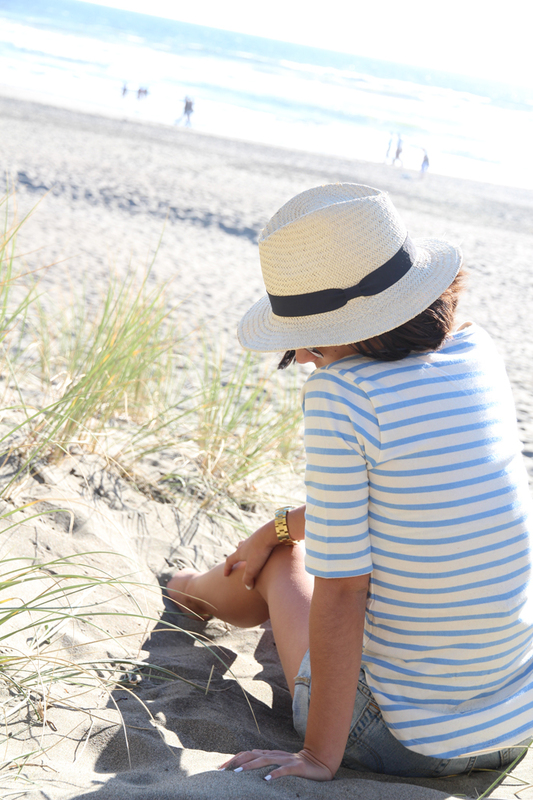 othing better on a summer beach day that stripes and a straw hat. Love how chill this is. The hat really finishes up the look. So cute. That is such an adorable top! I'm contemplating on getting it! I ♥ your outfits,I'm following your blog hoping to stay connected. Great beach look! Two of my favorite things right now..stripes and hats. I love to see the stylemint shirts on someone because im so hesitant to buy some of them not knowing how they really fit! Awesome pictures and I love this outfit! Love the styles! Super summer-y and trendy! Accessorizing is always a MUST! www.Roselets.com - Beautiful Hand made accessories - Sizzling Summer Style! This is the quintessential summer/beach outfit!